Simon Ndlovu, a motorbike mechanic from Soweto, found himself without a job when a number of companies he worked for closed down. His only choice was to start his own business fixing bikes. "Losing my job has been a blessing. I regret not having started my own business a long time ago", he said. 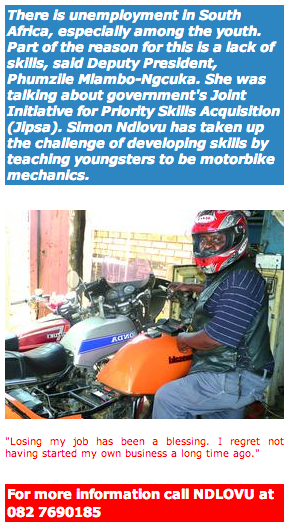 Ndlovu has been working as a motorbike mechanic for the past 32 years. Happy to be his own boss now, he is also a mentor and teacher to the youth. Most of the youth who have lessons with Ndlovu are in high school. After school, they get together at his small workshop in Tshiawelo, Soweto, for their daily lessons. "I have helped so many young people, I have lost count. 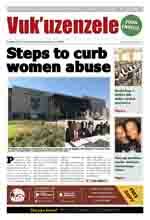 Many of them now have jobs; some are working in town," Ndlovu said. "It makes me very happy to see young people concentrating on doing good things rather than resorting to criminal activities." He rewards his students for their interest in learning new skills by teaching them to ride motorbikes, buying them school uniforms and generally helping them with funds for their school needs. Judging from all the bikes in his workshop that need to be fixed, it is clear that there is a growing need for this kind of work in Soweto. Ndlovu's dream is to own a bigger workshop fitted with all the tools he needs and more space for his classes. He has applied for funds from government programmes to grow his business. He recently found out about these funds. In the meantime, to reach his goals, he is not waiting for hand-outs from government. He believes that if funding does come his way, it will find him working hard to improve his business. His advice to the youth is to be patient and make time to learn skills which might be useful for them in the future. "There are more opportunities now than when I was young. I have faced discrimination in the workplace and had to endure harassment. But I didn't give up, because I wanted to learn," he said. "I don't regret having been patient during those trying times. Now, I depend only on myself and I'm my own boss,"
Ndlovu does not expect government to do things for him, but rather does what he can for his country. In this way, he is making a contribution towards Jipsa without even realising it.